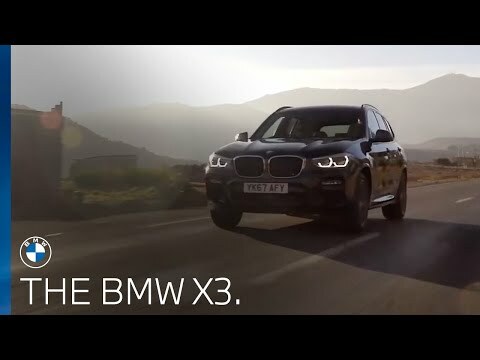 Enhanced design features, advanced technologies, semi-autonomous driving and an all-wheel drive system make this the most modern and intelligent BMW X3 to date. Redesigned and more sophisticated than ever the BMW X3 boasts stunning design qualities. Enhanced proportions, striking contours and a wider stance on the exterior create a lasting impression while the Premium Vernasca leather upholsteries, Phytonic Blue exterior paintwork currently only offered on the X3 and Adaptive LED headlights provide further exclusiveness. Inside, the luxurious cabin showcases an acoustically-enhanced interior overall to reduce external sounds and wind noise for a more soothing drive. The BMW X3 is a perfect match of dynamics and safety promising a driving experience that’s unrivalled in the SUV class. Supreme comfort, clear safety features and high torque together with impressive traction and agility are just some of what to expect when experiencing the BMW X3. Delivering features such as BMW xDrive and an Automatic Gearbox as standard, the X3 boasts greater efficiency and lower fuel consumption meaning power is not sacrificed thanks to BMW EfficientDynamics. The TwinPower Turbo inline 6-cylinder diesel engine delivers noticeably impressive power, 195kW (265hp) and a maximum torque of 620Nm and thanks to cutting-edge lightweight construction combined with aerodynamic measures, an optimised drag coefficient is achieved. The sharply defined rear design with trailing edges and aerodynamically optimised exterior mirrors and the Air Curtain in the front apron compliment these dynamics further. Modern in design and pioneering in its concept the BMW X3 allows you to stay connected with the use of exclusive services and smart apps. You have the option to select from a host of optional ultra-modern driver assistance systems, including Driving Assistant Plus which allows for automated assistance in situations such as traffic jams. BMW Connected is your personal aid when inside the BMW X3 allowing you to reach your destinations comfortably and on time. Available in an xLine model and M Sport model for an intensified X3 experience, the xLine includes matt Aluminium on the vertical slats of the BMW kidney grille, side skirt panelling and underbody protection at the front and rear while the M Sport aerodynamics package features a sporty exterior boasting 20” alloy wheels, Double-spoke 699 M styles in Orbit Grey gloss-lathed and the rear apron in Dark Shadow metallic. Part of the M Performance family and powered by an impressive 360hp output, the BMW X3 M40i pushes limits. Its breath-taking agility, high precision handling and the extremely high driving stability on every surface make it the undisputed leader in its class. The adrenaline pumping M Performance TwinPower Turbo inline 6-cylinder petrol engine propels the BMW X3 M40i from zero to 62mph in 4.8 seconds. Impressed? A maximum torque of 500Nm and mind-blowing engine output of 360 hp (265kW) will ensure your adrenaline kick will be included.